"Pebble time steel keeps you connected to the things that matter most, and look great doing it. Its unparalleled battery lasts up to 10 days between charges, and its bright always-on display never keeps you waiting. Pebble's new timeline interface respects that busy people want to Get things done. Includes Pebble health, a Built-in activity and sleep tracker with daily reports and Weekly insights. With a new color e-paper screen and a thin, comfortable ergonomic design, the Pebble time steel smartwatch is the companion you'll want with you every moment, every day. 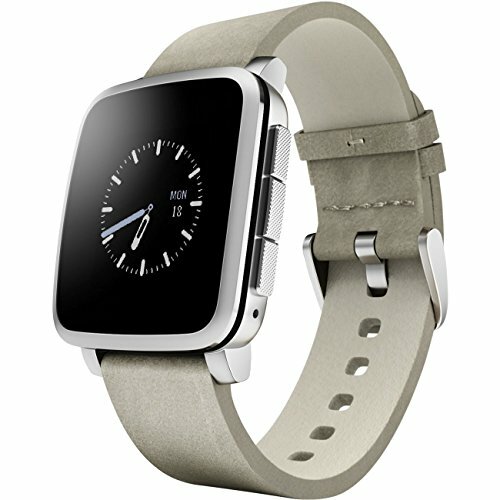 Made of marine grade stainless steel chassis and bezel, pvd Coated in matte with polished detailing, Plus tough, 2.5D glass display - time steel is the best looking Pebble we've ever made! includes: USB Magnetic charging cable 2mm Leather band. Both the Pebble Time and Pebble Time Steel are water resistant up to 3ATM, according to the ISO 22810 standard. This means that Pebble Time is able to stay on your wrist as long as you don't go deeper than 30 meters under water. So feel free to wear your Pebble Time in the shower, in the rain, while doing dishes, or while fishing, swimming, snorkeling etc. Just keep it above 30 meters and please also be aware that Pebble Time is only water-resistant as long as the seal remains in tact. For that reason, please do not press the buttons while Pebble is submerged. If you do take Pebble Time with you in saltwater, please be sure to give it a rinse with fresh water shortly afterward. This will help prevent the salt from damaging the finish of your smartwatch or salt crystals from drying in button crevices and making them sticky or immobile. With consideration to heat, Pebble Time has been tested to work within the temperature range of -10°C to 60°C (14°F to 140°F). Please be sure to remove your Pebble Time before participating in activities that would expose Pebble to temperatures outside of that range, such as saunas or steam rooms."